align_corners =True. which is defatult before pytorch 0.4.0. I want to know when should use align_corners=False ?? Have you seen the note and examples under Upsample? I think they do a great job in explaining why. Yeah, I check the example under Upsample. I don’t get it. Whether align_corners is False or True, the left top corner is always 1. Oh, my mistake. Now I get it. I will show you a 1-dimension example. Suppose that you want to resize tensor [0, 1] to [?, ?, ?, ? ], so the factor=2. Now we only care about coordinates. For mode=‘bilinear’ and align_corners=False, the result is the same with opencv and other popular image processing libraries (I guess). Corresponding coordinates are [-0.25, 0.25, 0.75, 1.25] which are calculate by x_original = (x_upsamle + 0.5) / 2 - 0.5. Then you can these coordinates to interpolate. For mode=‘bilinear’ and align_corners=True, corresponding coordinates are [0, 1/3, 2/3, 1]. From this, you can see why this is called align_corners=True. I will be very happy if you find this answer useful. Talk is cheap, show you the code! I have the same doubt. The corners are the same, what is the difference? Here is a simple illustration I made showing how a 4x4 image is upsampled to 8x8. 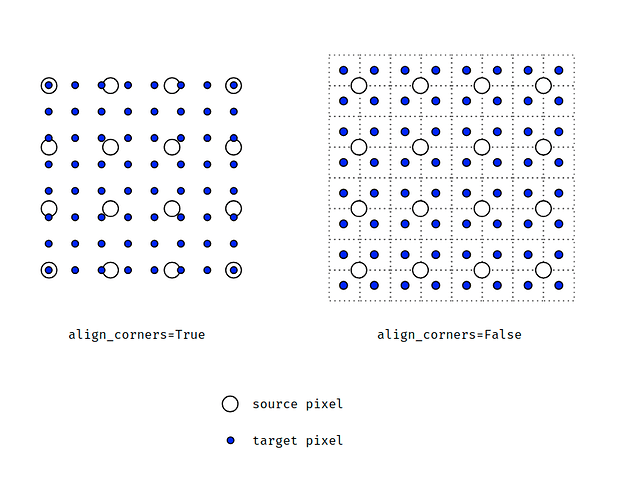 When align_corners=True, pixels are regarded as a grid of points. Points at the corners are aligned. 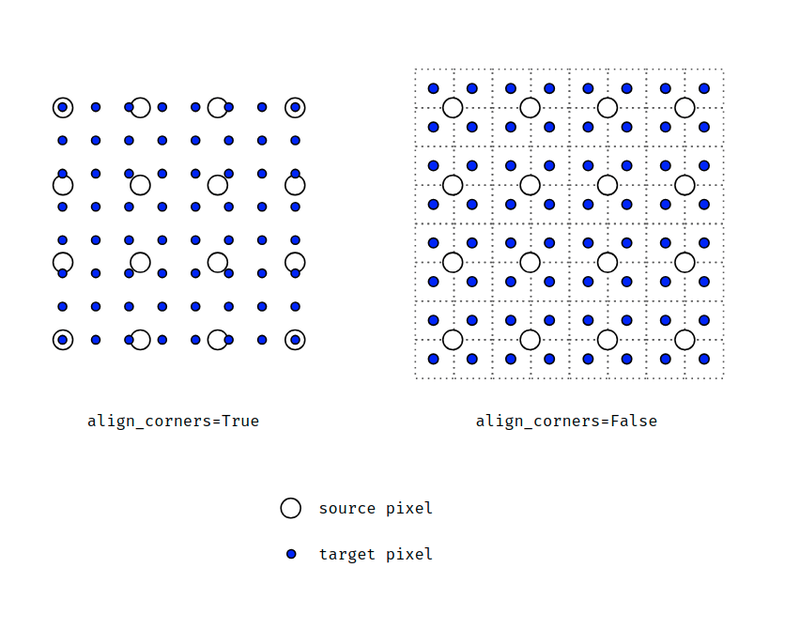 When align_corners=False, pixels are regarded as 1x1 areas. Area boundaries, rather than their centers, are aligned.